The economical and lightweight CDB-210 analog meter has proven to be highly accurate and dependable for a wide variety of applications. Spanning the entire measurement range of 0.2 to 20,000 mS (0.1 to 10,000 ppm) in five increments with automatic temperature compensation, readings are accurate ±2% of full scale. These models feature a long-life, replaceable probe and will operate for over 200 hours using the internal batteries. Model CDB-210 can also be line operated on 110/220 Vac (optional AC power pack). The large 15 cm (6") analog displays can be seen in any light and at any distance. Process trends and changes are clearly shown. The dials can be marked with grease markers or tape to show range marks or limits. Analog displays give stable, instantaneous readings, no flipping of switching to obtain the correct reading. 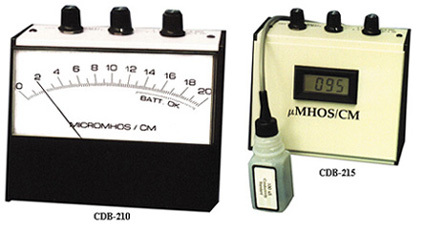 Features normally found in large laboratory conductivity meters are condensed into the CDB-215 digital models. Accurate readings over the full 0.2 to 20,000 mS/cm range are displayed on a large, easy-to-read, 9 cm (3.5") digit LCD. Units have precision calibration capabilities, automatic temperature compensation and replaceable probes. Please download the PDF file below for full product specifications and a complete list of available models. 참고: Each unit is supplied with probe, 2 oz. bottles of 100, 1000, 10,000 mS/cm standard and deionized water and complete operator’s manual.